There are two types of mining: surface and subsurface. There are three different types of surface mining: strip, open pit, and mountain top removal. There are three different types of subsurface mining: slope, drift, and shaft. 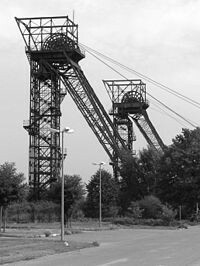 Strip mining is a form of surface mining that is mostly used for the extraction of coal. The rock and dirt covering the ore is removed. Once the ore has been removed from the first strip, a second strip is cut next to it, and the waste from the second strip is used to fill the first. This goes on until the ore is used up, and then the waste from the first strip is used to fill in the last one. Rock and dirt are removed in layers during strip mining. What is open pit mining? 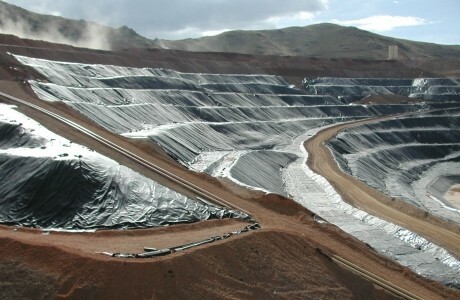 Open pit mining is when cuts are made into the ground and the area is worked around the circumference of the mine. This type of mining is also known as hard rock mining and is typically used to mine copper, gold, iron, aluminum, and other minerals. 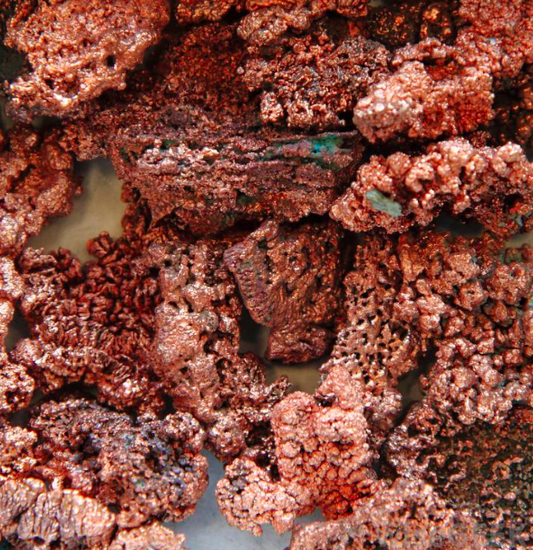 Copper is one of the many minerals that you would typically mine in open pit mining. 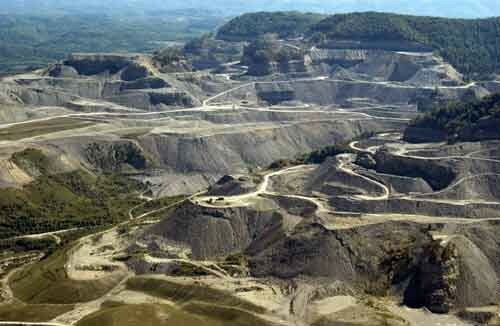 Mountaintop removal is any method of surface coal mining that destroys a mountaintop. Drift mining is the mining of an ore deposit by underground methods. 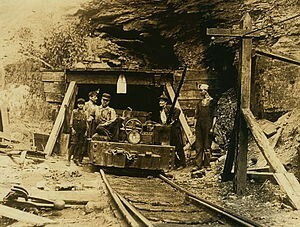 Shaft mining is the method of excavating a vertical tunnel from the top down. Hydraulic fracturing, or "fracking", is the process of drilling and injecting fluid into the ground at a high pressure in order to fracture shale rocks to release nature gas inside. Each gas well requires an average of 400 tanker trucks to carry water and supplies to and from the site. 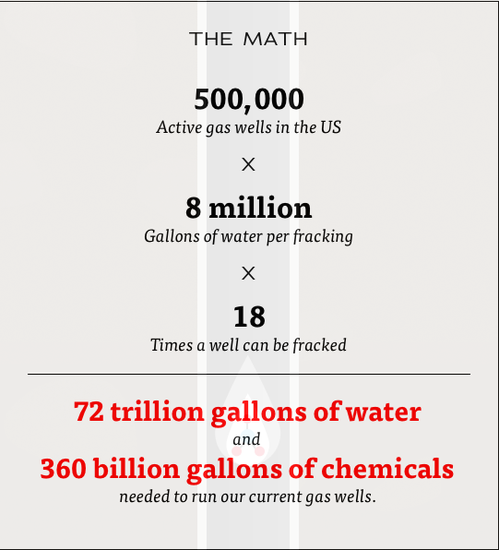 It takes 1-8 million gallons of water to complete each fracturing job. Up to 600 chemicals are used in fracking fluid, including known carcinogens and toxins such as: lead, uranium, mercury, ethylene glycol, radium, methanol, hydrochloric acid, and formaldehyde. The fracking fluid is then pressure injected into the ground through a drilled pipeline. The mixture reaches the end of the well where the high pressure causes the nearby shale rock to crack, creating fissures where natural gas flows into the well. During this process, methane gas and toxic chemicals leach out from the system and contaminate nearby groundwater. Meghan concentrations are 17x higher in drinking-water wells near fracturing sites than in normal wells. Contaminated well water is used for drinking water for nearby cities and towns. There have been over 1,000 documented cases of water contamination next to areas of gas drilling as well as cases of sensory, respiratory, and neurological damage due to ingested contaminated water. Only 30-50% of the fracturing fluid is recovered, the rest of the toxic fluid is left in the ground and is not biodegradable. The waste fluid is left in open air pits to evaporate, relating harmful VOC's (volatile organic compounds) into the atmosphere, creating contaminated air, acid rain, and ground level ozone. In the end, hydraulic fracking produces approximately 300,000 barrels of natural gas a day, but at the price of numerous environmental, safety, and health hazards.